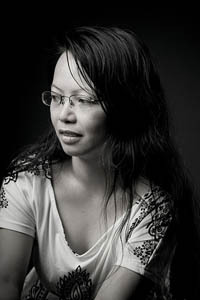 Ivy Alvarez is the author of Mortal (Red Morning Press, 2006). Her poetry is featured in anthologies, journals and new media in many countries, including Best Australian Poems 2009, and translated into Russian, Spanish, Japanese and Korean. The recipient of several awards, prizes and residencies, Ivy Alvarez received funding towards the writing of her second book of poems from the Australia Council of the Arts. In May 2011, she was invited to give readings in Seoul, Korea, as part of the Oz-Ko Poetry Tour. In addition to poetry, Alvarez writes plays, reviews and articles, and has served on the editorial board of a number of journals, including the Asia-Pacific Writers Network [apwn], Cordite Poetry Review and qarrtsiluni. Born in the Philippines, Ivy Alvarez grew up in Tasmania, Australia. She is currently resident in Cardiff, Wales, having previously lived in Scotland and the Republic of Ireland. Still, I had no comprehension poetry demands such a long apprenticeship. It makes me happy to know it will always remain a challenge. I am startled by the rhythm and incredible imagery in Ivy Alvarez’s work. Consider the graceful consonance in “An unidentified man”: "Seaward-facing, the man’s hunched back / became a rock, a boulder, bold in black". Or the rhyme and euphony in “Act”: "we are the breath and whisper in the darkened theatre / asking what it means when the actors bicker". I’m also always intrigued by how a poet comes to poetry. So, Ivy, why poetry? Ivy: I actually wrote both short stories and poetry, and have even won a couple of small short story competitions, when I was younger. However, I was lucky enough to receive consistent encouragement for my poetry from teachers and through publication in journals. It made me feel like I must’ve been doing something right. Still, I had no comprehension poetry demands such a long apprenticeship. It makes me happy to know it will always remain a challenge. Aileen: What does being a poet mean to you? What would you say have been your biggest sacrifices and biggest rewards, so far? Ivy: I don’t really know what the word poet means to me. Sometimes it doesn’t seem to apply because I don’t think I’ve reached that stage yet, a stage equivalent to a Professor Emerita in academia or a CEO in business. However, it is something I am still trying to realise, even as I know I’m quite a long way off. Biggest sacrifices? Oh, I don’t know. Perhaps it’s helped me to shed my youthful impatience. Many things to do with poetry do not happen with speed, so I’ve learnt to get on with other things, like writing more poems. The rewards for me are abundant. Poetry has enabled me to spend a month in New Hampshire, a month in Mojácar, three months in a Welsh museum, ten days in the Blue Mountains of Sydney and two weeks in Seoul, so I can write more poems. It’s led me to talk about poetry at universities in Chester, Winchester and Oxford. It’s given me grants so I can write and read and dream, which are both luxuries and necessities to me. Aileen: How do you begin a poem? Ivy: Let me count the ways. An image, a word, a strange combination of words, a confluence of sound, a series of images, a prompt, an overheard conversation, a newspaper article, a commission, a book by my bedside, a pressing urgency to set down a memory, a relationship — any one of these things might send me to my notebook and start setting down lines, get it down and exhaust it. Then I start shaping the poem: listen to the words as they bump and jostle against each other, cut out what is unnecessary, and so, gradually, turning the shadowy, unformed thing as close to what I see and hear in my mind, and bringing it into the light. Aileen: Your poem, "Hold," speaks of palms eventually being the "foot soles that have journeyed across the backs of river rocks." How did this image come to you? Ivy: If one were to do it literally — hold a smouldering lump of coal in one’s palms over and over again — callouses form. Eventually. Well, chefs do it, don’t they, when they work with hot food. They develop callouses so as to shield the tender parts underneath and, over time, it doesn’t hurt as much. Your feet do it, too. Skin does this marvellous thing to protect itself: a clever defence mechanism. Aileen: You mentioned in one interview that you're "most comfortable writing on a bed, in a well-lit room, with a window from which to gaze." Do you devote a certain number of hours a day to writing poems as an exercise? If so, how many poems do you usually attempt to write in a day? Ivy: A half-hour or so is fine for a start. The shaping might take longer, depending on the poem. There’s no set allotment. Each poem takes as long as it needs. I don’t begrudge it the time and these things turn out very unsatisfactorily if they are forced or hurried. When I left the Philippines, there were two things I missed: the food and the music. So perhaps when I pay attention to the sounds of words in my writing, this is because of my Filipino culture manifesting itself. For April, I usually try to write a poem a day. This has been my annual exercise since 2006. During that month, the thought continually oscillating in my head is ‘I must write a poem today.’ Oftentimes things are more conducive in the evening. I can steal away a half-hour or so and draft my one poem for the day. I have not tried to write more than two poems (drafts, that is) in a day, which is what happens when I have some time dedicated to writing, say, while away at a residency. Perhaps I should, though. It could be quite a challenge. Aileen: Which poets or writers most influenced your work? And among our contemporary poets, who do you most admire? Ivy: My earliest encounter of poetry that resonated with me was Sylvia Plath’s work. I am so grateful to have been introduced to her poems when I was just starting out. Others include the Australian poet Dorothy Porter, the American poets Ai and Sharon Olds, as well as Robert Browning and Chaucer. I also greatly admire the accomplishments of Eileen Tabios and Nick Carbó. Among my peers, I value the emotional inventiveness in Rebecca Loudon’s poetry, particularly her latest work, Cadaver Dogs. I was also recently introduced to Korean poet KIM Un’s writing and his poetry is also thrillingly inventive, especially within the prose poem form. Aileen: You were born in the Philippines, grew up in Australia, and lived in Scotland, Ireland, and Wales, with working visits to the US, Spain, and Korea, in between. You can't get any more diasporic than that. How much of being Filipino surfaces in your poetry? Ivy: When I left the Philippines, there were two things I missed: the food and the music. So perhaps when I pay attention to the sounds of words in my writing, this is because of my Filipino culture manifesting itself. I also have a sneaking suspicion my tendency towards sentimentality is part of this, though I have tried to express this as heightened emotion in my work. The poems in Mortal contain a few nods to my Filipino heritage. However, even that is problematic as I wish to remove identifiers, so that there is a sense of placelessness about my poems. The setting isn’t necessarily the Philippines or Australia: it could take place anywhere. I believe valuing placelessness is my rebellion. I also believe I exhibit a strong work ethic, which I’d like to think comes from my Filipino heritage, especially regarding the administrative side of writing: getting my poems in journals, applying for grants and residencies, and so on. Or maybe it’s just my mother setting a good example, by virtue of her being academically accomplished and ambitious in her public service career. Aileen: How would you describe the literary scene in Cardiff compared to the US? Or Spain versus Korea, from a Filipino Australian's point of view? Ivy: On a local level, Cardiff is experiencing a strong resurgence in its live literary scene, especially over the last few years, though its publication climate has always been consistent and steady. From what I can gather of the US live literary scene (and bearing in mind I’m an outsider looking in), it is a vibrant and welcoming one, whereas publishing one’s work presents more of a challenge. Still, there is such a breadth of possibility and room enough, it seems, for everyone’s aesthetics, which makes me happy to think on. Even when there is conflict, well, when people are talking about poetry so passionately, there’s no doubting its relevance and primacy in their lives. In Australia, literary culture is marginalised, with sport being the dominant preoccupation and what brings most of the population together. Still, this means poetry has to fight a little harder to get people’s attention, making the small victories sweeter. In the UK, there seems to be more balance. Poetry can feel so ephemeral at times. Paying attention to the physical side of things provides a balance to a life mostly lived in my head. Another contrast: the established literary voices in the UK are more visible; whereas in Australia there is an openness to the new, of giving up-and-coming writers a fair go. I only have a glancing acquaintance of what happens within the literary cultures of Spain and Korea, seeing as I was in Mojácar for a month— and that within the context of a writing retreat—while I was in Seoul for only two weeks. It is not really enough to comment adequately on what goes on in these countries. I’d love to visit there for a longer span of time before I can do so. Perhaps that’s a little cheeky of me! What I can say is both Spanish and Korean cultures value poetry very highly, which is incredibly heartening. Aileen: What project/s are you working on now? Ivy: I have been writing a lot more prose poems. Although I’m still trying to get a handle on this hybrid form, I’ve been receiving a lot of encouragement, so I’d like to keep going with it. I am also about to embark on the writing of my third collection, focusing on a personally intriguing part of my Filipino heritage. Aileen: Which non-literary pursuits do you find most helpful to your writing life? Ivy: I run. I cook. I knit. (Not all at once, I hasten to add.) Such pursuits provide the satisfaction of quantification. When I run 5km, cook a Korean meal, knit twenty rows, or finish a cardigan or beret, these are visible things.